Heart disease is a silent disease with 75% of the patients being unaware of the presence of the disease. Therefore, only 25% would receive any kind of treatment (statins, aspirin, beta blockers, hospitalization, thrombolytic therapy, angioplasty, stent, and bypass). According to Dr. Rajeev Gupta, the direct economic burden of heart disease in India could be 200 billion rupees ($ 4.5 billion). This would increase to 800 billion rupees ($ 18 billion) if 100% of the CAD patients were aware and received necessary treatment. Indirect costs would make the numbers even higher. India has been known as a land of disparity. According to a new report from the Asian Development Bank (ADB) published by the Times Nation (August 23, 2010), 75% (825 millions) of Indians are poor with an earning less than Rs.1035 per month; 20% or 224 million are lower middle class earning Rs1035-2070; 4% (45 million) are middle middle class earning Rs 2070-5177 per month. Only 0.45% (5 million) are upper middle class earning Rs 5177 to 10,354 per month; less than one in one-thousand (0.0009%) Indians (1 million) are rich earning more than Rs 10,354 per month; Thus a total of 274 million are middle class with an annual income ranging from $275 to $2760 per year and one million earning more than $2760 per year (calculation based on the current exchange rate of Rs 45 per $1, but the purchasing parity is Rs 17.3). 1. Prabhakaran D, Yusuf S, Mehta S, et al. Two-year outcomes in patients admitted with non-ST elevation acute coronary syndrome: results of the OASIS registry 1 and 2. Indian heart journal. May-Jun 2005;57(3):217-225. 2. Reddy KS, Satija A. The Framingham Heart Study: impact on the prevention and control of cardiovascular diseases in India. Prog Cardiovasc Dis. Jul-Aug 2010;53(1):21-27. 3. Mahal A, Karan A, Engelgau MM. The Economic Implications of Non-Communicable Disease for India: avaible at WWW.World Bank/documents and reports. Accessed November 1, 2010;2010. 4. Vamadevan AS, Shah BR, Califf RM, Prabhakaran D. Cardiovascular research in India: a perspective. Am Heart J. Mar 2011;161(3):431-438. 5. 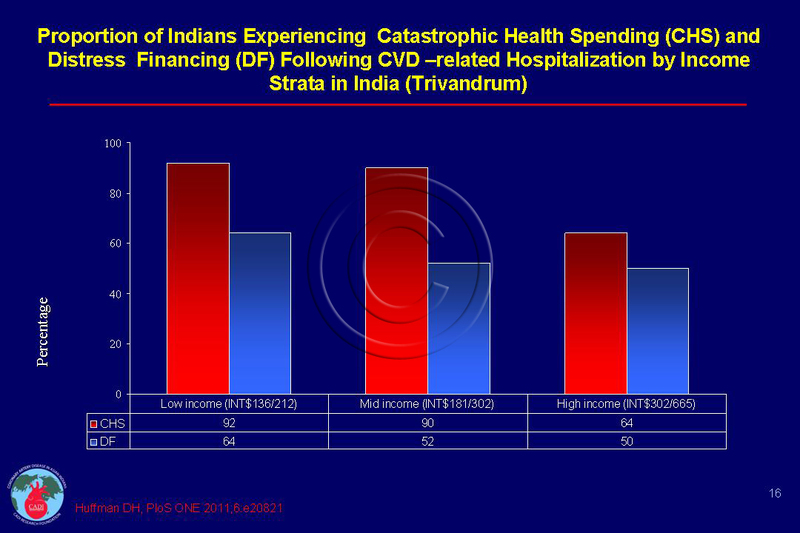 Gupta R. Coronary heart disease in India: Absolute numbers and economic burden. 2004 April 6. 6. World Health Organization. 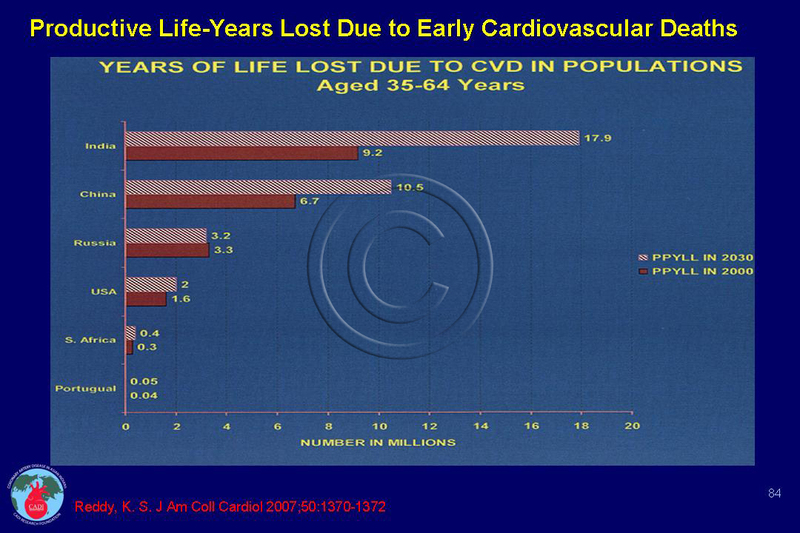 Prevention of cardiovascular disease: A vital investment. World Health Organization, Geneva Switzerland2007. 7. Prabhakaran D, Yusuf S. Cardiovascular disease in India: lessons learnt & challenges ahead. Indian J Med Res. Nov 2010;132(5):529-530. 8. Ramachandran A, Ramachandran S, Snehalatha C, et al. Increasing expenditure on health care incurred by diabetic subjects in a developing country: a study from India. Diabetes Care. Feb 2007;30(2):252-256. 9. Gupta R, Guptha S, Joshi R, Xavier D. Translating evidence into policy for cardiovascular disease control in India. Health Res Policy Syst. 2011;9:8. 10. van Doorslaer E, O’Donnell O, Rannan-Eliya RP, et al. Effect of payments for health care on poverty estimates in 11 countries in Asia: an analysis of household survey data. Lancet. Oct 14 2006;368(9544):1357-1364. 11. Huffman M D, Rao KD, Pichon-Riviere A, et al. A cross-sectional study of the microeconomic impact of cardiovascular disease hospitalization in four low- and middle-income countries. PLoS ONE. 2011;6(6):e20821.